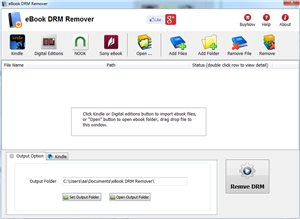 eBook DRM Removal Bundle is all in one tools to remove ebook DRM protection, it support Adobe Digital editions drm ADEPT, Kindle and Barnes Noble ebooks. it is easy to use and drag drop to work. user can view non-drm ebook on iPad, NOOK, Sony Reader. Support for EBook DRM Removal is available from the Publisher site. Planetsofts.com didn't scan EBook DRM Removal for viruses adware, spyware, or other badware. For safety reasons, we recommend that you always keep an updated antivirus installed on your pc when downloading and installing software from the web.